"NRSV" redirects here. For the New York City punk band, see No Redeeming Social Value. OT: Biblia Hebraica Stuttgartensia with Dead Sea Scrolls and Septuagint influence. Apocrypha: Septuagint with Vulgate influence. NT: 81% correspondence to Nestle-Aland Novum Testamentum Graece 27th edition. Formal equivalence, with minimal gender-neutral paraphrasing. The NRSV was intended as a translation to serve devotional, liturgical and scholarly needs of the broadest possible range of religious adherents. The full translation includes the books of the standard Protestant canon as well as the books traditionally included in the canons of Roman Catholicism and Orthodox Christianity (“Deuterocanonical” books). 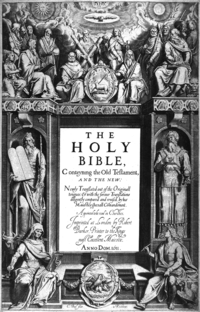 The translation appears in three main formats: an edition including only the books of the Protestant canon, a Roman Catholic Edition with all the books of that canon in their customary order, and The Common Bible, which includes all books that appear in Protestant, Roman Catholic, and Orthodox canons. Special editions of the NRSV employ British spelling and grammar. The Old Testament translation of the RSV was completed before the Dead Sea Scrolls were available to scholars. The NRSV was intended to take advantage of this and other manuscript discoveries, and to reflect advances in scholarship. The RSV retained the archaic second person familiar forms ("thee and thou") when God was addressed but eliminated their use in other contexts. The NRSV eliminated all such archaisms. In a prefatory essay to readers, the translation committee said that "although some readers may regret this change, it should be pointed out that in the original languages neither the Old Testament nor the New makes any linguistic distinction between addressing a human being and addressing the Deity." The following scholars were active on the NRSV Bible Translation Committee at the time of publication. Roland E. Murphy, O. Carm. The New Revised Standard Version is the version most commonly preferred by biblical scholars and used in the most influential publications in the field. Many of the older mainline Protestant churches officially approve the NRSV for both private and public use. The Episcopal Church and the Anglican Communion in Canon II.2 added the NRSV to the list of translations approved for church services. It is also widely used by the United Methodist Church, the Evangelical Lutheran Church in America, the Christian Church (Disciples of Christ), Presbyterian Church (USA), the United Church of Christ, the Reformed Church in America, and the United Church of Canada. In accordance with the Code of Canon Law Canon 825.1, the New Revised Standard Version, Catholic Edition, has the imprimatur of the United States Conference of Catholic Bishops and the Canadian Conference of Catholic Bishops, granted on 12 September 1991 and 15 October 1991 respectively, meaning that the NRSV (Catholic Edition) is officially approved by the Catholic Church and can be profitably used by Catholics privately in study and devotional reading. For public worship, such as at weekly mass, most Catholic Bishops Conferences in English-speaking countries require the use of other translations, either the adapted New American Bible in the dioceses of the United States and the Philippines or the Jerusalem Bible in most of the rest of the English-speaking world. However, the Canadian conference and the Vatican approved a modification of the NRSV for lectionary use in 2008, and an adapted version is also under consideration for approval in England and Wales, in Ireland, and in Scotland. The NRSV, along with the RSV, is also one of the texts adapted and quoted in the English-language edition of the Catechism of the Catholic Church. In 1990 the synod of the Orthodox Church in America decided not to permit use of the NRSV in liturgy or in Bible studies on the grounds that it is highly "divergent from the Holy Scriptures traditionally read aloud in the sacred services of the Church", though the National Council of Churches notes that the translation has "the blessing of a leader of the Greek Orthodox Church." 1 2 "Liturgical Books In The English Speaking World". Official Website of United States Conference of Catholic Bishops. United States Conference of Catholic Bishops. Retrieved 10 October 2011. ↑ Bishop Tikhon. "Bishop's Pastoral Letter on the New Revised Standard Version". Retrieved 2007-04-22. Barker, Margaret (2001). "Isaiah". In Dunn, James D.G. ; Rogerson, John. Eerdmans Commentary on the Bible. Eerdmans. Coogan, Michael D. (2007). "Isaiah". In Coogan, Michael D.; Brettler, Mark Zvi; Newsom, Carol Ann. New Oxford Annotated Bible. Oxford University Press. Saldarini, Anthony J. (2001). "Matthew". In Dunn, James D.G. ; Rogerson, John. Eerdmans Commentary on the Bible. Eerdmans. Sweeney, Marvin A (1996). Isaiah 1 – 39: with an introduction to prophetic literature. Eerdmans.